Check out my 49ers-Buccaneers postgame Periscope report below. C’est la vie, and sacré bleu! 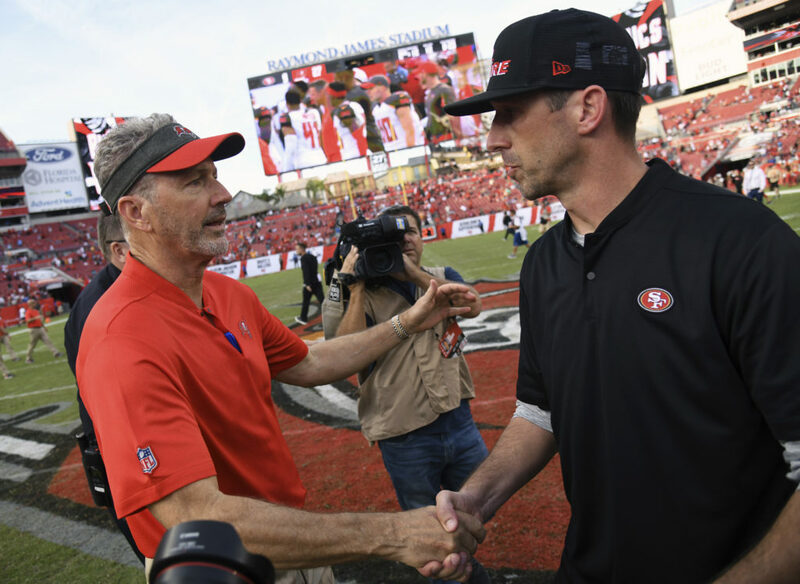 Kyle Shanahan is the next HUE JACKSON! Horrible coach and we are stuck with this POS! Too bad this is not an elegant tank. Listened to the podcast as I always do. Same old stuff. JL and KS and everyone else should be on the hot seat. I did have to replay the part where Coach G states that he is “Infinitely” a better GM than Lynch. Even by coach’s standards I was taken back by that heaping helping of arrogance. I would imagine that he would imagine he’d most likely be a better head coach than Kyle. Like I said, not much new here. Same old jaw dropping stuff. The 49ers are YEARS away from becoming even respectable. Look at the players dropping like flies. The are horrible coached. Why is ARMSTEAD or JIMMY WARD on this team? ARM TACKLERS! Ward is a paper player and should be cut today. Armstead needs to be going too. We have horrible coaches on the defense. SALEH is a total joke. Shanahan is way above above his abilities. The media won’t touch SHANAHAN they are afraid to. Mark my words in two years he will be gone. Man, Shanahan makes JIMMY T look like VINCE LOMARDI! I will be glad when that happens and I might come back as a 49er fan. Grant, can you PLEASE tell Jed York to SELL THE DAMN TEAM already? Wow, Grant sounded really MAD there. Face it, this was a 6 and 10 team with Jimmy G and I suspected they still would’ve lost to the Bucs. 27-9 and Lorenzo Neal on KTVU is calling out the officiating for the call on Witherspoon. To me, Witherspoon needs to be DUMPED. Agree with most of what Grant said except he wasn’t hard enough on Lynch. Lynch is too positive. Too optimistic. Too subjective. Need a GM who is objective and critical and unemotional. Lynch calls up Joe Williams on the phone and after a phone call puts him back on his board. What!?!? You can’t make that kind of decision off a phone call. Hey Ahkello, are you going to tackle? OK, good, we are taking you. Hey, I took classes with Solomon. He is a good guy. I am taking him. Reuben lights up the locker room. Great personality. We love him. Lynch is just too personable and bases decisions on subjective feelings. No way you can make good decisions that way. Lynch never should have been hired. But the Lynch decision shows Kyle’s insecurity. He didn’t want to be threatened by anyone who knew what he was doing. Kyle needs to go also. Nonetheless, I expect them to both be around next year. A lot of people bought a ticket on hype train this year ignoring the fact we were not that great of team heading into the season. Throw in all the injuries to key players at the most important positions in a KS system and you folks still think we had a chance? This is not madden football and we are fans not coaches for reason. If you don’t have the faith, then kick rocks.